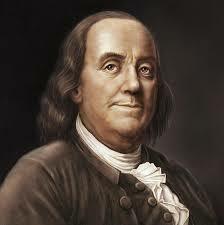 When I interpret Benjamin Franklin, I encounter people with varying degrees of knowledge about the man. Sometimes the person is a foreign visitor, with little or no consciousness of Benjamin Franklin. Occasionally, and wonderfully, I meet someone with a vast storehouse of knowledge of Dr. Franklin and his life and times. Most often, we meet somewhere in between. The fact that Franklin has been a public figure for three hundred years means that there has been much said and published about him, resulting from vastly different degrees of research and accurate information. Even in Philadelphia, where Ben Franklin is a household name, and unfortunately, an icon, people see him in different ways. The worst of these perceptions is Franklin the wacky mascot. He is seen by many people as a tinkerer, spending his time flying kites and inventing things. Others believe that Franklin single-handedly founded every institution in Philadelphia with one hand, while writing the Declaration and the Constitution with the other, and somehow inventing electricity with his third hand. This larger-than-life perception is especially destructive, because it places Franklin beyond the reach of ordinary mortals. This means that the humanity of the man, which could inspire achievement in contemporary lives, is lost in the myth. Benjamin Franklin was, in reality, an extraordinary man who succeeded by virtue of hard work, extreme curiosity and practicality. His civic accomplishments were not achieved by single-handed effort, but rather by good old-fashioned networking and making connections. Franklin forged compromises and coalitions, using the power of the press to great advantage. He would have an idea, or be approached with a suggestion, then float the concept in his Pennsylvania Gazette. If the idea was well received by the public, the battle was half-won already. The inventions, or as Ben called them, his “improvements”, were usually the result of frustration with something not working as he thought it should. His natural curiosity and practicality demanded that he fix it. These were not earth-shaking discoveries, for the most part, just good-sense solutions. No patents, no profit, no “gadgets”. Some, like the lightning rod, revolutionized everyday life. Others just made things a bit more convenient for Benjamin Franklin. In the world of science, however, or natural philosophy as it was known in the eighteenth century, Benjamin Franklin’s accomplishments are often under-appreciated. Franklin did not simply fly a kite, though the study of lightning and its properties were quite important. He studied the properties of electricity with a passion and thoroughness that was unprecedented at the time. He coined terms like current and battery, discovering that electricity flowed like a river, and that electrified jars could provide more power by joining them together like a battery of cannon. He published his findings abroad, and was inducted into the most prestigious scientific societies of his day. He received the Copley Medal from the Royal Society in London, which would be like receiving a Nobel Prize today. Much of Franklin’s success in foreign diplomacy was a result of his being the most familiar and respected American in Europe. So, let us see Franklin, not as an other-worldly genius, though this second-grade dropout certainly possessed genius in many ways, but as a down-to-earth mortal who elevated himself and his society with tools accessible to other mortals with the right dreams and sufficient willingness to go beyond what life has handed us. "A consummate actor and diligent researcher, Bill Robling makes Ben Franklin come to life."